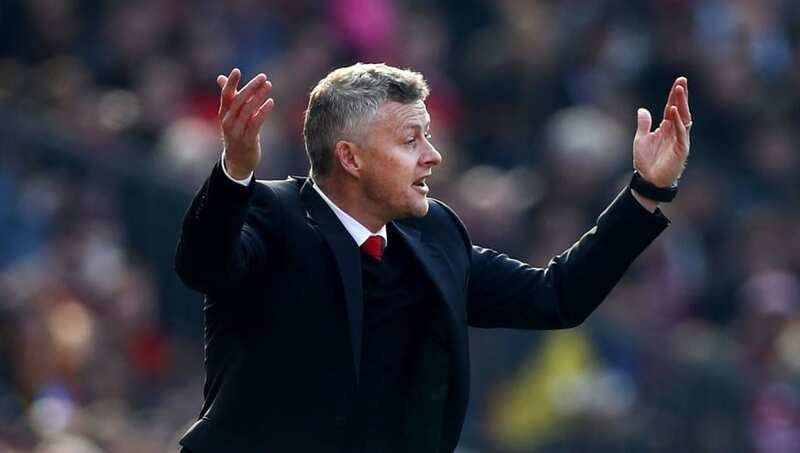 Manchester United manager Ole Gunnar Solskjaer is facing investigation after being caught committing several driving offences on Saturday evening, following his side's narrow 2-1 win over Watford. Solskjaer, 46, was handed a three-year contract to be United's permanent boss on Thursday, and saw his side scrape to victory on Saturday afternoon after goals from Marcus Rashford and Anthony Martial. It was a nervy affair for United though, with Watford having the better of the game. Abdoulaye Doucoure earned a late consolation, but it wasn't enough for a point. The Norwegian, who admitted there was tension on the home bench late on, left Old Trafford at around 7:10pm on Saturday evening to return home. He was spotted by fans getting in to his silver Volvo XC60, but was later caught on camera by fans cruising at high speeds with his hands in the air, clearly not on the wheel. Stopped at traffic lights further on his route home, a local elderly lady - who was walking the streets returning from the shop at the time - ​confirmed to 90min that the person at the wheel of the car was indeed Solskjaer, who she described as "looking relieved that ​United had managed to hold on to three points" earlier in the day. She confirmed that loud music was blaring from Solskjaer's car with the windows all the way down, while he "sped off on the amber light like a 17-year-old boy racer who had just passed his driver's test in a modded-up 2004 Citroen Saxo". The lady, named ​April, spoke to 90min about what she saw: "I love Ole, we all do, but he looked a little bit out of control really. "He sped up to the lights and slammed his brakes on with his hands in the air," she continued. "He was singing that song. I don't go to watch United much any more but I think he was singing that 'Ole's at the wheel, tell me how good does it feel?' tune the fans keep singing. It's catchy, that. "He was dead good! But he looked a bit crazy. I caught a proper view of him at the lights. It's like he was completely enveloped in all the love the fans have given him since he came back to England. Surprised he hasn't bought a better car mind, since he's just probably got himself a massive sign on bonus. I was hoping for some Norwegian chocolate, but he didn't give me any. "Then he went 'whoosh' and was gone in a flash! It wasn't very responsible." ​April went on to confirm that another man, whom she believed to be United central defender ​Phil Jones, was sat in the passenger's seat the entire time with a distressed look on his face. Jones has a history of looking uncomfortable at the best of times, so lord only knows how he felt as the passenger in Solskjaer's car at the time. It's not yet certain whether police action will be taken in light of the information, but Solskjaer will be hoping he can get back to business quickly with a fixture against Wolves at Molineux set to take place on Tuesday night.